Drive from Bergen towards Voss along E-16. About 5 tunnels after Dale, you get to Bolstadøyri. The best exit is number 2, a bit more than one kilometer after the sign for the train station. Turn left, cross the river, go left, then uphill (right) to Horveid. 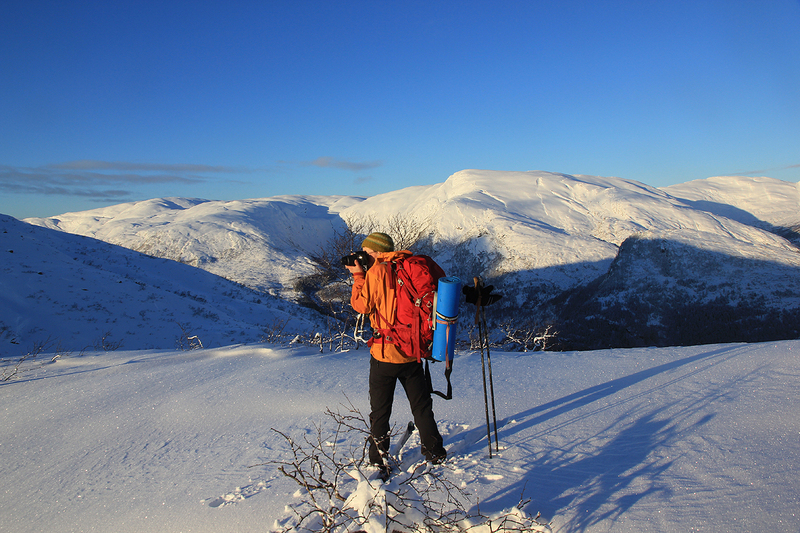 Turn right again and locate a toll road (self serve, NOK 30. in 2014) that serves the huts up by the mountain. There is one fork higher in the hillside where you should go right. There is parking at the end of the road, location N60.67604, E006.01030, elevation 490 meter. 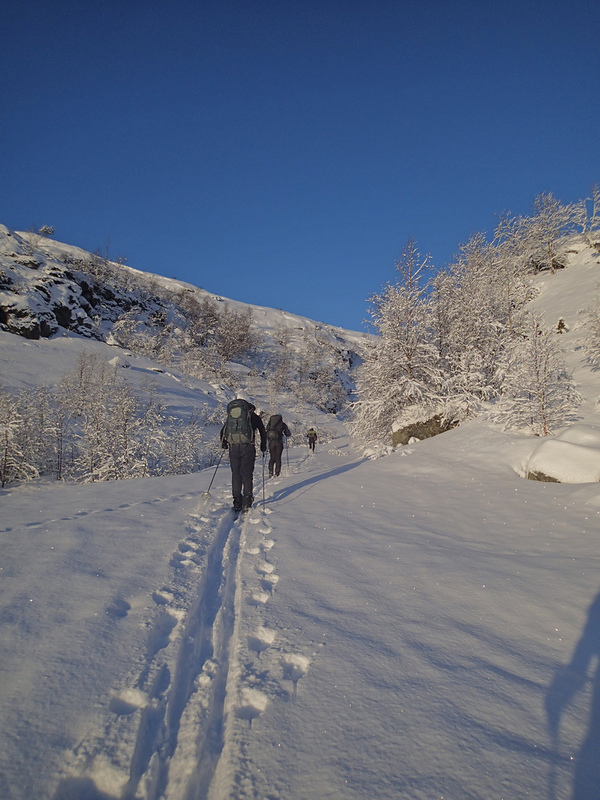 Follow the trail uphill to Rørgostølen, then further uphill in the small valley that tops out at the col Glimeskardet between Hatlekinni (900m) on your left and the ridge called Taulafjellet going up right. The first part of this ascent is slightly steeper, but with very nice skiing. Already here, the view west is getting quite good. 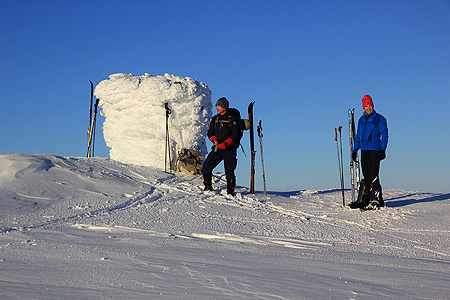 Continue up on Taulafjellet, the skiing continues to be nice and easy. Keep left of point 904 and ski down to Geilatjørnane (small lake) at location N60.70039, E006.04357, elevation about 860 meter. Evaluate the slope and snow conditions as there are some steeper slope here that should be avoided unless the snow is stable. Continue up the obvious and very gentle slope to the summit. 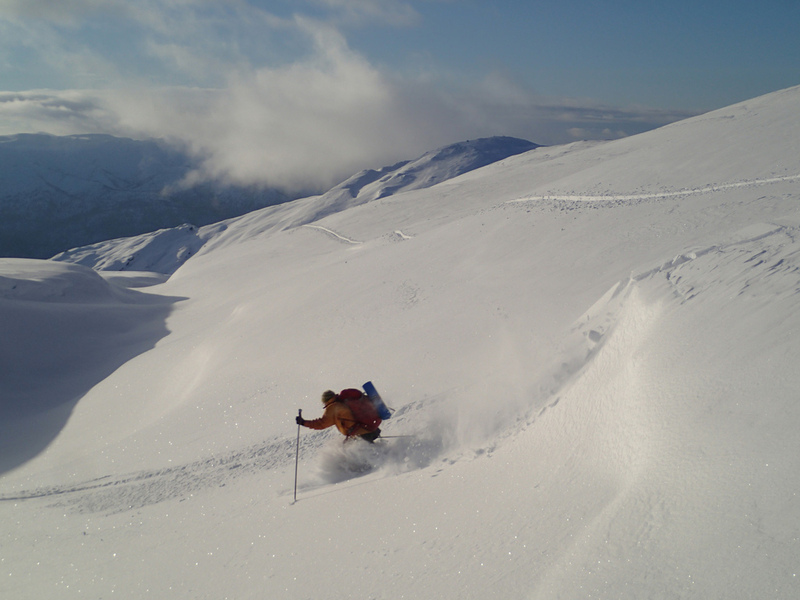 The return trip can be skied down the main ridge, thus making this a nice round-trip route. 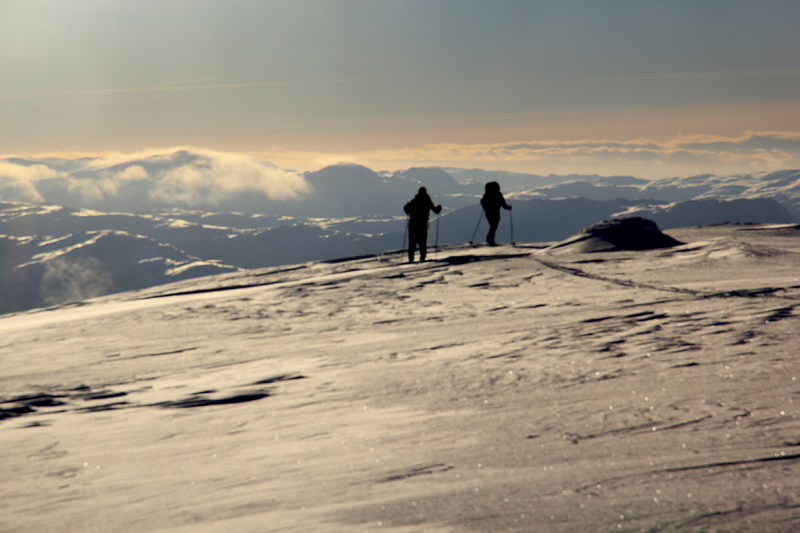 Stay close to the highest ridge and head down towards the top Tverrgavlen. Pass this on the right hand side and continue to Dunfjellet. 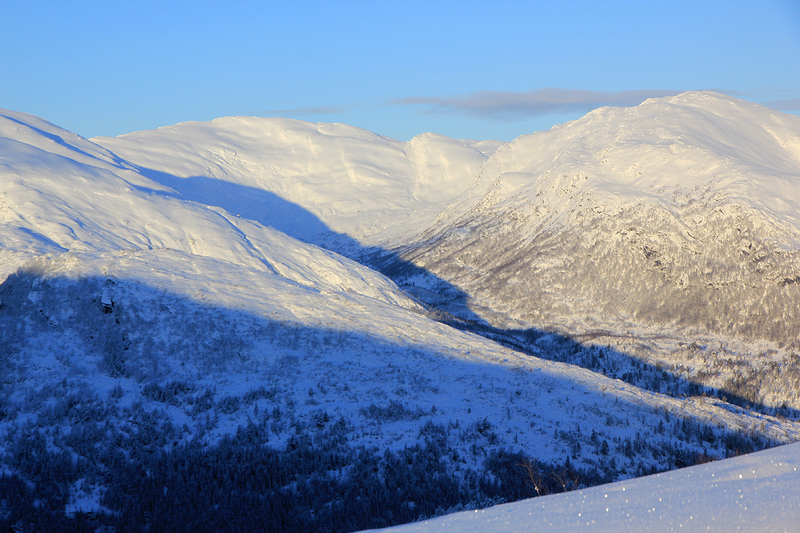 The south slope going down from Dunfjellet is very nice to ski. 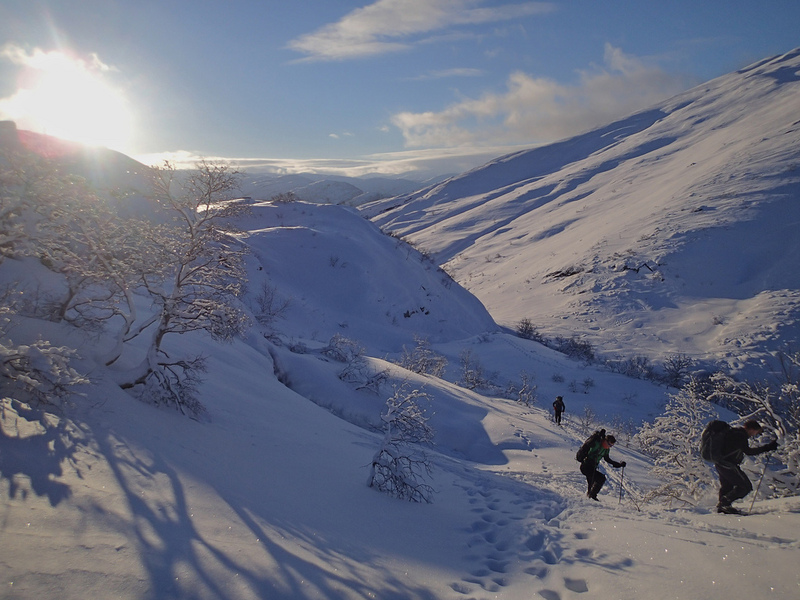 Head right before entering complex terrain / trees and ski north-west in order to descend into the main valley between your location and the ascent route. 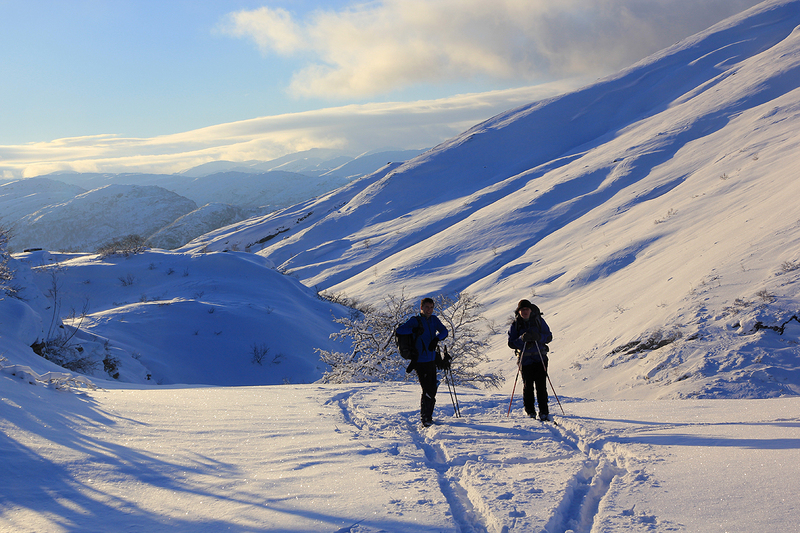 Ski a bit north (up the valley) in order to find a good location for the final descent to the river and cross it. The route then runs back down to the parking, staying on the right hand side of the river. 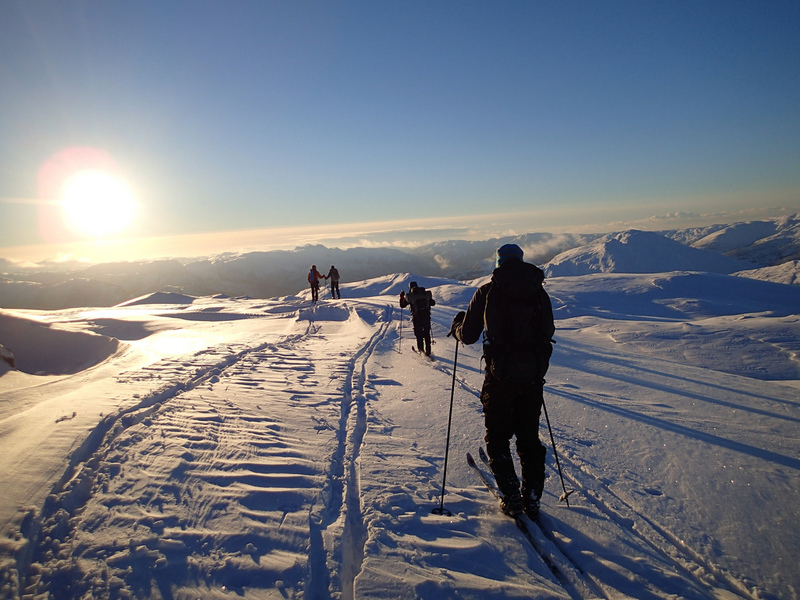 This was a trip organized as a one-day summit trip organized by the Bergen Mountaineering Club (Bergen Fjellsport). 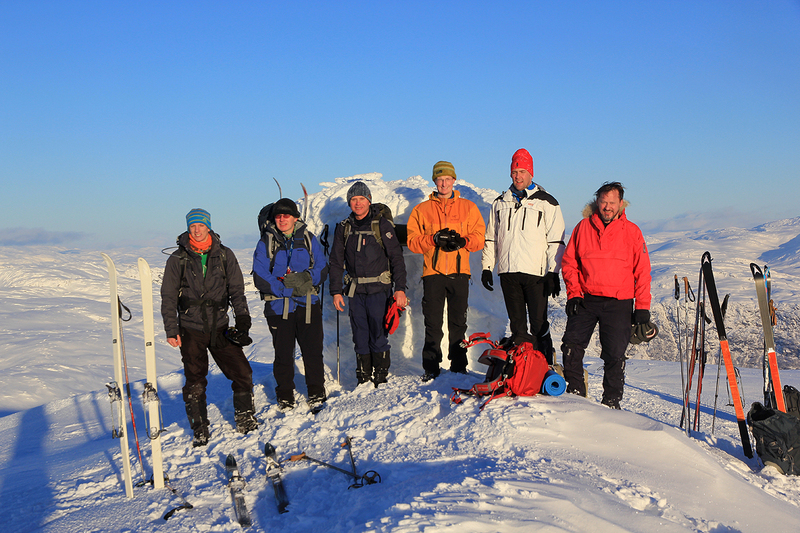 Participants were Fredrik, John G., Lars Olav, John R., Robert and Halvor. The skiing was good and everyone enjoyed the fine day. We started around 1100, and made a break for lunch just before the final uphill. Lars Olav broke trail most of the way. The group functioned very well and we made the summit shortly before 1400. After a break for photos as well as a good look at the very fine views, we skied down the main ridge and returned to the cars shortly before 1600. Thanks to all participants for a very memorable trip.